7:02AM BST - Mr Dalek opens his eyestalk. 7:03AM BST - Mr Dalek chats with Brain, comparing notes on plans to conquer the Earth. 7:06AM BST - Mr Dalek exterminates Brain, annoyed that Brain dared to have a plan that was better than Mr Dalek's. Mr Dalek quickly notes Brain's plan in his mind under "Plans I came up with myself". 7:08AM BST - Mr Dalek exterminates Fred for being a bit annoying. The rest of the gang on the shelf are starting to wake up and get concerned. 7:09AM BST - Drat! This is a busy day. Mr Dalek apologizes to everybody else for not killing them at the moment, but he has stuff to do. 7:10AM BST - Ok. One more. Mr Dalek exterminates a cute Time Patrol Weeping Angel on his way out the door, because it was looking at him funny. 7:15AM BST - Mr Dalek explores illicitly obtained internet backchatter. This is the day of the meeting. Everybody Mr Dalek needs to meet will be in the same room at the same time. Perfect! 7:24AM BST - Mr Dalek spots Adam hanging decorations and preparing food. Strange. Usually Adam has his meetings with friends on Mondays. This is a Saturday. Still, Adam wasn't going to help with this caper, so it is just as well that he is keeping busy. Mr Dalek would be annoyed if Adam had sat back watching television all day while Mr Dalek was making strides towards world conquest. 8AM BST - Mr Dalek has everything he needs, including the time of the airplane flight. Mr Dalek had considered just flying to New York directly, but his propulsion system is not quite strong enough to cross an ocean - yet. Good enough to get to Heathrow Airport, good enough to get from Newark Airport to the destination, and let British Airways do the rest. Mr Dalek lives in the UK (till the conquest) - may as well fly British. 9:15AM BST - Mr Dalek arrives at Heathrow Airport. 9:20AM BST - Mr Dalek sneaks through security via the pocket of a worker in a Duty Free shop. 9:25AM BST - Mr Dalek hops into the bag of a person boarding a British Airways flight. The times match. Excellent. 10:27AM BST - The flight from Heathrow finally takes off, 35 minutes late. Thank goodness Mr Dalek is taking an early flight. 11:27AM EDT (4:27AM BST) - Mr Dalek looks out the window of the flight. He can see the coast of New York. Which he should not be able to see. The plane should be getting ready to land in Newark by now. A quick hack into the flight instructions (Mr Dalek wishes the flight path was still available on a TV channel to people flying like they used to) reveals that Mr Dalek is on the WRONG flight. This is a flight from Heathrow Airport to Dulles Airport in Virginia. Hundreds of miles from New York City. Drat. New plan needed. 11:29AM EDT - Mr Dalek has thought this through. If he makes the pilot land the plane, people will act like 9/11 and US flight traffic will shut down for days, keeping Mr Dalek from getting home. Crashing the plane, same result. BUT - if Mr Dalek cuts a hole just big enough to zip out himself, it will depressurize just enough for an emergency landing, but not enough for terrorists to be suspected. Mr Dalek can land himself, and airplanes will be available later. 11:31AM EDT - Mr Dalek found the plane surprisingly hard to cut through, but he has succeeded. Hello, New York City air! (Cough) Mr Dalek admits that air in Virginia would have been nicer to breathe. 12:15PM EDT - Mr Dalek gets to the United Nations building. The meeting is at 2PM. Should be easy to hide in the meeting room. 1:14PM EDT - Frustrated at the building, Mr Dalek interrogates a janitor. Alas, the janitor does not speak English and Mr Dalek does not speak Spanish, but the janitor does point out the map of the building. Mr Dalek studies it. 1:19PM EDT - Success! Mr Dalek is in the meeting room. He finds a good hiding place in the podium for the speaker and waits. 2:07PM EDT - The G7 ambassadors have gathered in the room (the ambassador from China was a bit delayed, and interrogated the unluckiest janitor in New York City to find the fastest way to the room). The time is right to start a 2 minute countdown. 2:09PM EDT - "Hello, gang! I am Mr Dalek. I am one of the most powerful beings you will meet. I am here to blackmail you all. If you do not help me out recording a single to be the Interplanetary entry at Eurovision, I shall embarrass you all. Normally I would kill, but that would unite your countries, which does not do me much good. So record my single, or I shall release all your personal passwords on youtube. Including passwords to the secret pajamagram accounts you would rather your wives did not know existed." 2:16PM EDT - On the third attempt, the ambassadors pull off a surprisingly good rendition of Mr Dalek's song. First line - "WAR! Ung! What is it good for - absolutely everything!" No one ever accused Mr Dalek of writing original song lyrics. 2:21PM EDT - The recording is complete. Mr Dalek prepares to leave. The British ambassador breaks down in tears. Mr Dalek hates it when they cry. "What is the problem?" asks Mr Dalek. "I became British ambassador, I scheduled meetings on Saturdays in April, all of it to avoid any reference to Doctor Who. I HATE that show. And then you come in here and remind me of it. As if I was watching today's premiere." "Hang on," replies Mr Dalek, "today's premiere?" 2:23PM EDT - A quick review of the ambassadors confirms that Doctor Who is resuming in the UK today. Mr Dalek is terrified. Doctor Who is his weekly ritual. Know your enemy. 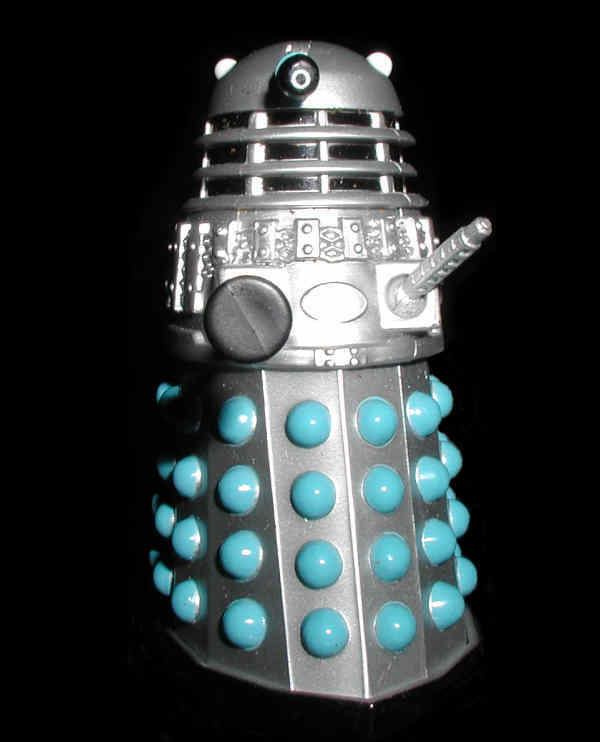 Mr Dalek has not missed a premiere since the return in 2005. Now he has less than 5 hours to get back to the UK before the 7PM premiere. Not enough time to fly. 2:24PM EDT "Mr British ambassador, what do you mean - 5 hour time difference, and the show started at 6:20PM BST????" 2:25PM EDT Mr Dalek tries to call Adam, but his phone is off the hook. Adam always keeps the phone off the hook while watching Doctor Who premieres. Adam must have known the premiere was tonight, and let Mr Dalek head off across the ocean anyway. Mr Dalek will deal with this betrayal at a later date. It seems he must find his own way to watch the Doctor Who premiere. 2:26PM EDT But first, Mr Dalek decides to get revenge on the ambassadors who made fools of him by not bringing this problem up 17 minutes earlier. Mr Dalek systematically destroys every soda machine in the UN building, and trashes the gift shop. The UN will be humiliated. Our luckless janitor is about to learn what is worse than being assaulted by a toy Dalek and a Chinese ambassador in the same hour - cleaning up the mess at the UN. 2:31PM EDT Mr Dalek looks through his rolodex of data. First, there is a guy who seems to know all about Doctor Who broadcasts. Puts out a weekly guide. Time to place a phone call. 2:32PM EDT "Hello. You have reached the voicemail for Benjamin _______. Normally I answer my phone calls, but today is the Doctor Who premiere in the UK. I can't see it today - I don't live in the UK and my computers have certain technological limitations. One year ago I sounded an alarm about the problems with Doctor Who broadcasting around the world, starting with how annoyed were that episodes were getting delayed before international broadcast. I suppose technically the situation is better now, but they have pointedly refused to do day and date broadcasting. The swine! Come on now! I mean ..."
2:37PM EDT "... Not to mention all the lost viewers who refuse to tune in weeks later for often edited episodes with big ugly bugs on the screen, mediocre picture quality, clips from the next episode spoiling plotlines in the middle of the episode you're watching ..."
2:40PM EDT "... For the record, I am not obsessed ..."
2:43PM EDT Mr Dalek decides to try Chris from Radio Free Skaro on Skype. 2:44PM EDT "Look, buddy, I'm not sure I can help you here. My source for Doctor Who episodes is locked down - no new people can join the service. If they even think that I let other people have access to my copy, I will lose my access. I run a podcast - I have to be able to see the episodes on schedule before we do our podcasts. It's called research. And for the record, I am not going to salute you just because you're a Dalek, by gar. Be off with you." 2:45PM EDT Mr Dalek angrily sends a message back through time to February. 2:46PM EDT "Mr Dalek, did you just alter the timeline? I now have memories of nearly losing my place on the team. Somehow a podcast didn't record. All our episode numbers have changed! Stay out of my business. I know the Bridging The Rift people. Even Erik!" 3:25PM EDT Mr Dalek finishes going through his rolodex of contacts. Mr Dalek needs a better set of contacts. Nobody can get him the Doctor Who episode. 3:26PM EDT Mr Dalek tries Bit-Torrent. 3:27PM EDT Mr Dalek is infected by 5 computer viruses. Emergency purge! 3:34PM EDT Systems purged, Mr Dalek decides that Bit-Torrent files can be dangerous. Maybe it will be on a usenet newsgroup. 8:02PM EDT Only 1% downloaded. Pathetic. 8:03PM EDT Youtube! Of course. Everybody puts TV shows up on youtube. 8:04PM EDT Terrible picture quality. Barely audible sound. But it is something. Mr Dalek watches segment 1 of 7. 8:13PM EDT All the subsequent sections have been pulled offline for copyright violation and the user has been banned. 8:15PM EDT All the copies of the episode on Youtube have been pulled. Mr Dalek admits defeat. 8:17PM EDT Mr Dalek flies down Rt 1 into New Jersey. He will rent a room for the night and charge it on Adam's card. That will teach Adam not to let Mr Dalek miss his Doctor Who research. Mr Dalek will overpay for the room, order expensive research, and rent every possible pay per view. 10:10PM EDT Have you any idea how hard it is to get any sort of room near New York on a Saturday night? Mr Dalek has checked in to a motel 5 miles from Newark Airport. Alas, Adam will not suffer as much financial loss as desired. 10:24PM EDT A knock on the door. Who would knock at this hour? None of Mr Dalek's mortal enemies know where he is. And all of his immortal enemies are Jewish - technically the Jewish Sabbath is over, but they would wait till at least Sunday before causing trouble. 10:25PM EDT Ah, it's Adam. How did you get here so fast? I mean, I'm so angry at you. 10:26PM EDT How nice! Adam made a DVD of the Doctor Who episode and flew it and him over here on his secret Concorde jet, the last one in use on Earth. Mr Dalek will still make him suffer later for missing the live broadcast, but this does help prove that Adam cares. Even better, Adam's recording won't have that evil DVD region coding on it, so even the Panasonic DVD player in the motel will play the disc. 10:30PM EDT This Panasonic was only designed to handle NTSC video, and Adam's recording came out as PAL! AAArgh! 10:31PM EDT Adam pulls out his laptop. Will Adam be able to cope with watching the episode on a screen this small? 10:33PM EDT Adam brought a projector as well. Mr Dalek and Adam sit back to watch the 65 minute premiere on one of the motel room walls. 11:45PM EDT Mr Dalek's day is done. Time to turn off and recharge. No copyright infringement intended. This story is not for profit and merely for entertainment. Doctor Who is copyright the BBC.